As I was telling a week ago, I got me some PocketWizards. Last week I shared why I thought that PWs were a good choice. There was quite an interesting debate on the comments whether this “industry standard” set is worth its high mark price – $169 apiece and you need two – and I recommend reading those comments and opinions before making any decisions. In this post, I will share my thoughts on the PWs. My likes and dislikes. Now, this goes without saying (yet, I’ll say it anyway) those are my opinions, there are not absolute truths (and my wife will testify to that). I am also aware of the fact that a lot has been written about this set, however, they are still considered the standard and for that alone deserve the attention. 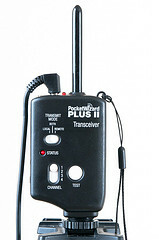 The PocketWizard kit is very slim in accessories. The box has the PW itself, a string tie thingy (very useful), 2 AA batteries and a short 3.5mm to PC-sync cable. Oh, and a manual. The kit actually includes the bare minimum to start working with the PocketWizards if you are using a strobe/lightstand/swivel setup (as I). The sync cord fits into the sync port on any Nikon Flash (or modified Canon flash). 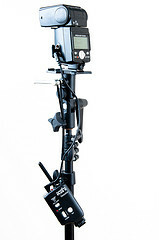 If you are using a studio flash, though you would have to buy or hack an extra cord. Obviously the main function of a PocketWizard is to remotely sync between camera and flash. The dry spec says they sync up to 1/250 and that was the case with my testing on the D300. I did hear some canon user complain that the actual sync speed is only 1/160, yet did not happen here. Got full 1/250. Aside the power switch, each unit of the PW has two additional switches and a test button. The test button obviously test that you can pop the flash. Click once on the attached unit to verify that flash and PW are well attached. Click a second time on the remote unit to verify radio connectivity. Really helpful. The first switch is the channel selection switch – there are four channels. That should be enough for four photographers sharing a radio spectrum. Each would use a different channel for their flashes. The second switch is the position selection switch – for lack of a better term. The PocketWizard will automatically identify if it is acting in slave or master modes. If detection fails, which has happen to me once or twice, you can manually set the mode. In general I find it useful to pop the camera once or twice after attaching the PWs, just so each one know who he is. Lastly, there is a status LED that blinks as the flash pops. As for build, I am kinda split. On one hand the set feels pretty well build. On the other it is big and light. If I had to guess I would say that the box consists mostly of air and batteries. I wish it was smaller. Speaking of batteries, they are removed with s “gentle tap” on the back. I cringe every time I do this. A small ribbon inside the battery compartment would have made a huge change. The camera side is well handled and the kit mounts on the hotshoe. The remote side has three mounting options (none is optimal). -The fastest and most impromptu way to mount the remote side is to use the included wire to dangle the PocketWizard from a swivel. Kinda shaky, yet works fine. This is how I have used it so far. – Next is the Hotshoe leg that the PW has. Some light modifiers dedicated to small flashes (like Photoflex LiteDome) has an extra shoe mount for PWs on their brackets. – Lastly, you can use a caddy or a screw on the back side of the PW for some cool cable mount hack. I’ve been using the PocketWizards for a month and a half and did not have a misfire yet. (That is like quadrizillion times better than my poverty wizard good/fail ratio). I did do a couple of stress tests on the units. In this test I went out to see if the PW will match the D300 8 frames per second. The PW performed well. In this test, I took a picture (the one at the top of the post), than asked the model to jump again and again as I got further and further from the strobe. Perfect every time. I got about 70 meter away before the PW gave up on me. (not that my street is paved now, this was done last week and is a huge improvement on our quality of life). Am I happy? I sure am. I got to a pint where I could no longer trust my strobes and pocketwizards got that trust back. Was it worth $169 a piece? well considering that Those units will probably take about 10,000 photographs in the years to come, the price seems right.